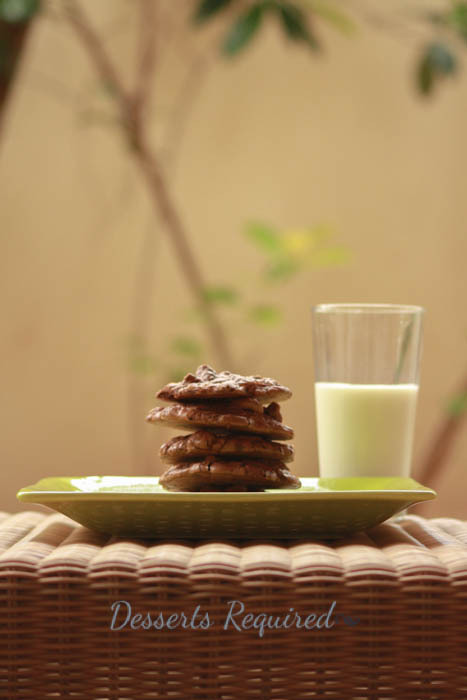 Double Chocolate Double Nut Cookies sound heavenly, don’t you agree? Double Chocolate Double Nut Cookies started out as a craving for an amazing cookie that I had bought at Norman Love Confections in Naples. I have not stopped thinking about this cookie. I bought one with the intention of giving it as a part of a gift for a friend with whom I was staying; unfortunately, by the time I got to her home, only half a cookie remained. So, I kind of kept it to the side while presenting her with the other delectable treats. Finally, the other night I couldn’t take it anymore. I love Ina Garten’s books, because they are incredibly easy to follow and her recipes have never let me down. I found her chocolate peanut butter gobs and thought that they had a similar exterior to the one from NLC. I decided to use this recipe as the foundation for my cookies. Ina’s recipe calls for peanut butter chips but I wasn’t in a peanut butter mood, so I added more chocolate. Why not? These cookies are wonderful. Rich and chocolatey and they have a fabulous crackly outside. Are they exactly like the ones from Norman Love Confections? 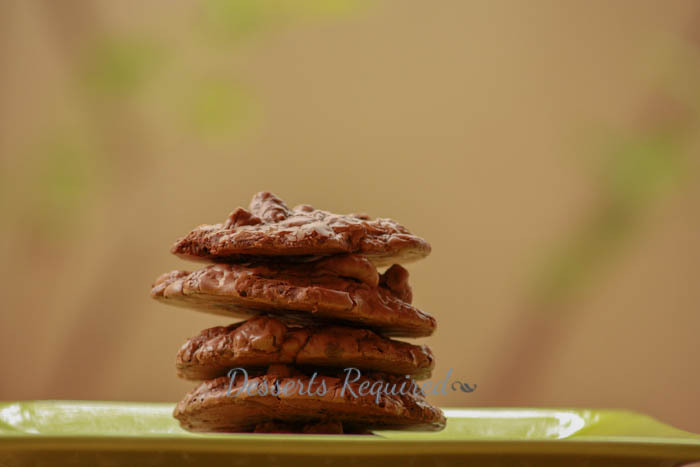 No, but until my next trip to Naples and/or Ft. Myers or until Chef Norman decides to write a cookbook and include the recipe, these Double Chocolate Double Nut Cookies will suffice quite nicely. Place the butter, 6 ounces of semisweet or bittersweet chocolate chips and the unsweetened chocolate into a microwaveable bowl. Microwave until nearly melted and then stir until the mixture is completely melted. Set aside to cool for 15 minutes. In a large mixing bowl, mix the eggs and egg yolk, espresso powder and vanilla to combine. Add the sugar until the mixture is thick and creamy, about 2 minutes. With the mixer on low, add in the melted chocolate mixture. Blend in the flour, baking powder and salt. Remove from the mixer and fold in the remaining 10½ ounces of chocolate chips, walnuts and pecans. 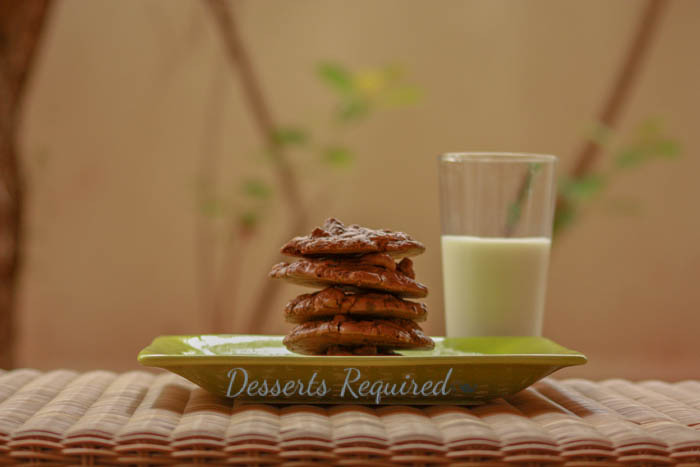 Use a large cookie scoop (roughly 3 tablespoons) to transfer the dough to the prepared baking sheets. The batter will spread just a bit so leave about 1” in between cookies. Bake at 325° for 15 minutes, rotating the pans top to bottom and front to back halfway through. I am in such a cookie mood today!!! YUM!!! After eating an entire batch of Double Chocolate Double Nut Cookies, I can understand why! If I only have regular instant coffee and not instant espresso and I only have pecans and macadamia nuts, am I better off finding a different recipe altogether until I have the actual ingredients called for in the recipe? That is really a personal choice. I would substitute the coffee for the espresso as well as the nuts as long as you like the combination of pecans and macadamia nuts together. Thanks. I never thought about the taste of the two nuts together. Guess walnuts would be better. That is what I think, too, Mary.